S corporations (S-corps) are pass-through entities where the income, deductions, and credits of the corporation pass through to its owners. S-corp tax rates are the same as the personal income tax rates. That’s because the owners pay taxes on their share of the S-corp’s income. Some states impose S-corp taxes. S Corp taxation can get tricky, especially since the company usually needs to pay salaries to its shareholders. It’s important to keep track of the S corp’s income and expenses. Consider using QuickBooks to keep track of your S Corp’s finances. Save up to 50% off QuickBooks Online. S-corps pass their income, deductions, and credits through to the owners of the company. The S-corp is responsible for completing its own tax return and allocating its income to shareholders. Shareholders pay tax on their personal tax returns on their share of the S-corp net earnings and on salary paid to them. At a minimum, an S corporation (S-corp) must file Form 1120S and Schedule K-1. An S-corp typically has employees, and this requires running payroll and filing payroll tax returns, including Form 940 and Form 941. S-corps may also need to file informational returns, such as Form 1099. S-corps will also need to issue Form W-2 to employees and Form 1099-MISC to independent contractors. If your S-corp needs to run payroll, you should check out the payroll software Gusto. The company is our recommended payroll software for small businesses. It automates payroll for you by calculating paychecks, computing payroll taxes, and automatically transferring your payroll data to the payroll tax forms so you can easily file and pay on time. Form 1120S Income tax return for the S-corp. Learn how to complete Form 1120S. Schedule K-1 This form reports each owner’s share of net earnings of the S-corp.
Form 940 Annual payroll tax return for federal unemployment taxes (FUTA). Form 941 Quarterly payroll tax return for federal withholding and FICA taxes. Form 1099 Report payments made to independent contractors using Form 1099. Form W-2 Report wages paid to employees on Form W-2 instead of Form 1099. The due date for S-corp tax return Form 1120S is March 15th for S-corps that operate their business on a calendar year. For S-corps with a fiscal year, the due date is the 15th day of the third month following the end of the fiscal year. Fiscal Year: With a fiscal year ending on June 30th, for example, the due date is September 15th. Extensions: S-corps can request an additional six months to file their Form 1120S. Request an extension using Form 7004. To be a valid extension, Form 7004 must be filed by the first due date. Weekends and Holidays: If the due date falls on the weekend or a federal holiday, then the due date is the following business day. S-corps generally do not pay federal corporate income tax. S-corp shareholders report their share of S-corp income on their personal tax returns. Thus, S-corp income is taxed at personal income tax rates, which currently range from a low of 10% to a high of 37%. Built-in gains tax: Corporate tax (currently 21%) applies to the sale of an asset that has increased in value, if that asset was acquired by the corporation before it elected S-corp status or if the S-corp acquired the asset from another C corporation in a tax-free transaction. For more details, refer to our guide on how to complete Form 1120S for tips on how to read complete Schedule D for Form 1120S. Excess net passive investment income tax: Corporate tax (currently 21%) applies to passive investment income (such as interest, dividends, royalties, and rents) if the S-corp has accumulated earnings and profits from years when it used to be a C corporation and if the S-corp’s passive investment income for the year is more than 25% of its gross receipts. For more details, read the IRS Instructions for Form 1120S. S corporations (S-corps) may be responsible for state taxes. Many states recognize S-corp status, meaning that the state taxes the S-corp’s income through the shareholder’s personal tax return. However, some states impose income tax, franchise tax, and/or excise taxes on the revenues, net income, or capital of the S-corp.
California: S-corps pay a corporate income tax at a rate of 1.5% on its net income. The CA corporate tax on S-corps has a minimum of $800. Shareholders also pay personal income tax on their share of the S-corp’s income. District of Columbia: S-corps pay corporate franchise tax at a rate of 8.25% on its net income. The District of Columbia imposes a minimum tax of $250 if gross receipts are less than or equal to $1 million, or $1,000 if gross receipts are more than $1 million. The District of Columbia does not recognize S-corp elections, so S-corps are treated exactly like C corporations for District of Columbia tax purposes. Louisiana: S-corps pay corporate income and franchise tax. The corporate income tax rates vary from 4% to 8% of the net income of the S-corp. A separate franchise tax applies based on the amount of capital employed in Louisiana. The franchise tax rate is 1.50% for each $1,000 of capital up to $300,000, plus $3 for each $1,000 of capital over $300,000. New Hampshire: S-corps are subject to the Business Profits Tax at a rate of 7.9% on net income. This 7.9% tax rate applies to tax years ending on or after December 31, 2018. Tennessee: S-corps are subject to the state business tax, state franchise and excise tax, and the city business tax. The state business tax rates vary by type of business. Texas: S-corps pay the Texas franchise tax at a rate of 0.375% (for retailers and wholesalers) or 0.75% (for other types of businesses) on the S-corp’s taxable margin. There is no franchise tax if the S-corp has revenues less than $1.13 million. For more info on what your state requires, check out our state tax agency map. The S-corp likely needs to file payroll tax returns, and may need to file information returns such as Form 1099. S-corps may need to file state tax returns. The S-corp may need to withhold tax on the income allocated to shareholders who live in a state other than where the S-corp operates. State S-Corp Taxes: In most states, S-corps file state tax returns and may have to pay state taxes. S-corps may need to withhold state tax on income allocated to shareholders who live outside the state where the S-corp conducts business. Be sure to do your research at your state tax agency website on what taxes an S-corp is required to pay. Collect Sales Tax: If you sell products or services that are taxable, then you must collect sales tax from your customers, and report and pay that tax to the state authorities. Payroll Tax: The S-corp will need to withhold payroll taxes from employees and file payroll tax returns with federal and state agencies. At the end of the year, the S-corp will need to issue Form W-2 to each employee. File Form 1099-MISC: An S-corp may need to prepare and file Form 1099-MISC if it paid money to independent contractors, attorneys, health care professionals, and for rent. Register in States Where Conducting Business: The S-corp may need to register in states where it conducts business. Each state has its own rules for what counts as conducting business in a state. 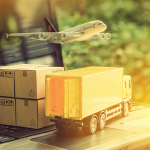 City Business License or Registration: The S-corp may need to obtain business registrations or business licenses in the cities where it conducts business operations. Pay Estimated Tax: The shareholders of the S-corp may need to make estimated tax payments (both federal and state) so that any tax related to their S-corp income is paid throughout the year. 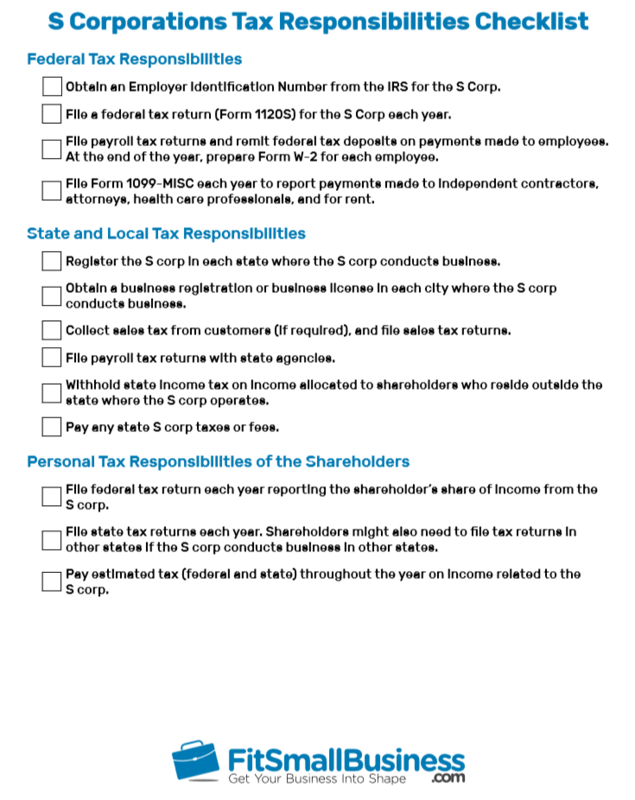 Personal Tax Returns: The shareholders of the S-corp will need to file their own personal tax returns reporting their share of the income from the S-corp.
To help you keep track of your responsibilities, we’ve created a free S-corp taxes checklist. S-corps have several tax advantages. S-corps have just one layer of taxation. Owners don’t pay self-employment tax. S-corp losses can reduce the owner’s taxes. But S-corps have disadvantages as well. S-corps need to file payroll tax returns. S-corp status can be lost, and sometimes S-corps pay corporate tax. S-corps have several tax advantages. There is no double taxation of corporate income. There is no self-employment tax on the net earnings passed through to shareholders. And corporate losses can reduce each owner’s tax bill. Avoids Double Taxation of Corporate Income: S-corp has a single layer of taxation—net income is taxed the shareholders’ personal tax returns. By contrast, the income of C corporations is taxed twice: once at the C corporation level on its net earnings and then at the shareholder level when the C corporation pays out dividends. No Self-Employment Taxes on S-Corp Net Earnings: S-corp shareholders pay income tax, but not self-employment tax, on their share of the net earnings of the S-corp. This stands in contrast to sole proprietors and partnerships, where the owners pay both income tax and self-employment tax on their net earnings. S-Corp Losses Can Reduce Owner’s Taxes: When the S-corp has a net loss for the year, that loss is passed through to the shareholders. Each owner may be able to reduce their income and their taxes by claiming this loss. By contrast, losses of a C corporation stay with the C corporation and offset profits in other years. S-corps have several disadvantages. Owners working for the business must be paid a salary. S-corp status might end if a new investor does not meet the S-corp eligibility criteria. S-corps that used to be C corporations might need to pay corporate tax on passive investment income or if highly-appreciated assets are sold. S-corps must pay owners a reasonable salary: An S-corp must pay salary to shareholders who work for the business. That means taxes must be withheld from the owner’s pay, payroll returns filed, and W-2 forms issued. S-corp status can be lost: The corporation can lose its S-corp status if it exceeds 100 shareholders, or if it takes on investors who are non-resident aliens, corporations, or partnerships. S-corps pay tax on passive income and built-in gains: If the S-corp used to be a C corporation, the S-corp may have to pay tax if it generates passive investment income or if it sells a highly appreciated asset that it acquired when it was a C corporation. Not all businesses qualify for S corporation (S-corp) tax treatment. To qualify for S-corp status, a business must satisfy six requirements. These requirements limit how many owners a business can have as well as the types of people or entities that can be owners. If you qualify, prepare Form 2553 and submit it to the IRS. Must be a domestic company. Must only have shareholders who are individuals, certain trusts, or estates. Must not have shareholders who are partnerships, corporations, or nonresident alien shareholders. No more than 100 shareholders. Not be an ineligible corporation. This includes certain financial institutions, insurance companies, and domestic international sales corporations. Once you have determined that you qualify as an S-corp, then you need to elect S-corp status. Complete Form 2553 (Election by a Small Business Corporation) and make sure it is signed by all shareholders. Submit Form 2553 to the IRS by the deadline. Newly formed corporation wants to be an S-corp from its date of incorporation: Submit Form 2553 to the IRS no later than two months and 15 days from the date of incorporation. Already existing C corporation wants to become an S-corp next year: Submit Form 2553 any time during the current year and no later than two months and 15 days into the next year. Already existing corporation that forgot to file Form 2553 and wants to request retroactive S-corp status: Submit Form 2553 no later than three years and 75 days from date the owners intended for S-corp status to take effect. Shareholders will need to explain why they are late in filing the election. In this article, we’ve covered the basic rules about S corporation (S-corp) taxes at the federal level. There is much more that could be said about S-corp taxes, however. Below we address some questions about S-corp taxes that come up often. If you have additional questions, feel free to post them in the Fit Small Business Forum, and we’ll get back to you with an answer. What Is the Difference Between LLC & S-Corp Taxes? S-corps are a type of pass-through entity where the business owners pay tax on their share of the business income on their personal tax returns. An LLC, by contrast, does not have its own tax classification; instead, business owners choose how their LLC is taxed. For more details, see our guide to LLC taxes. Do Shareholders of an S-Corp Pay Self-Employment Taxes? No. Shareholders of an S-corp do not pay self-employment tax on their share of the S-corp’s income. Instead, shareholders pay their Social Security tax and Medicare tax on their salary income from the S-corp. In addition, shareholders pay income tax on their share of the S-corp’s earnings. How Does the Pass-Through Deduction for S-Corps Work? Shareholders of the S-corp will claim the pass-through deduction on their personal 1040 tax return. This is a new deduction for 2018, and the deduction is scheduled to last through the year 2025. The pass-through deduction is worth at most 20% of the shareholder’s share of the S-corp’s net earnings, although there are various ways to calculate this deduction. Filing taxes as an S corporation (S-corp) may have many advantages for your business. However, it’s important to always consult a tax professional before making an election as an S-corp. Be sure to weigh all the options available and choose the business structure that works for you. Regardless of your business structure, we recommend using QuickBooks to keep track of everything you need to file your taxes. This accounting software tracks all income and expenses and compiles the information you need to fill out S-corp taxation documents. Get started and save up to 50% off QuickBooks Online. Upon the death of the owner, I Inherited half of the business The former owner and I created, I make about 38,000 a year salary from said business, while working 50 plus hours a week. I have never had to pay in for taxes as I claim 0 to get a “bonus” come tax time. I was completely blindsided as I ended up owing almost 10,000 in taxes. And I have only owned half for under half a year. We are doing better this year and fear I will owe in upwards of $22,000 by next tax time! MY partner has many assets and this year got a refund. I feel helpless and lost. any advice? Thank you. Hi George, I recommend that you locate a tax expert ASAP. You need to find out what your options are to reduce your tax liability so that you won’t be blindsided in the near future. We have a National Bookkeeper Directory that includes full service firms that provide bookkeeping, payroll and tax consultations. See if there is a local expert in your area. I like your website, it is very helpful. I have a question regarding how to record S Corp 1120 tax paid in Quickbooks? 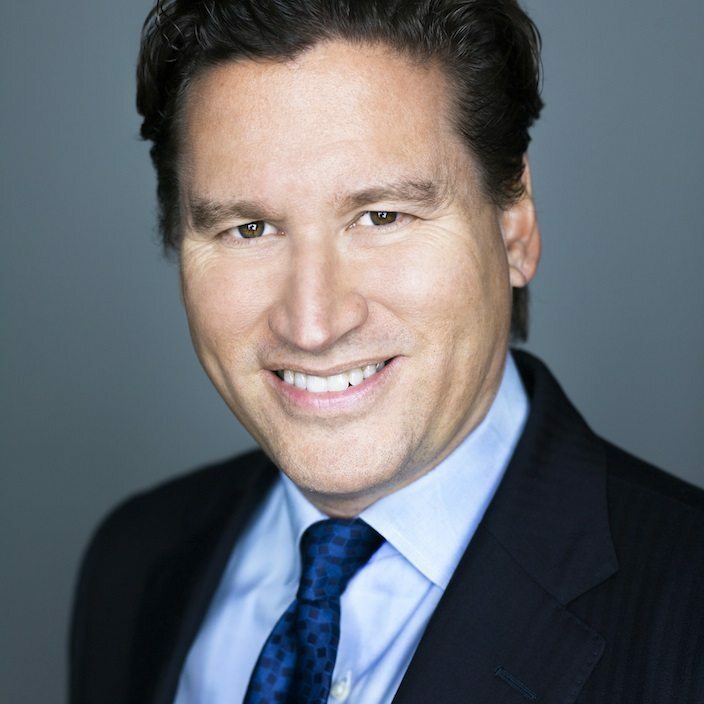 Is it Shareholder Distribution or Owner’s Withdrawal? Taxes paid belong in an expense account and if you received a distribution that should be coded to an Owner’s Draw account. Thanks so much for reading our articles! I elected Scorp incorporated in NM and I am resident of IL. Say, I have 40k drawn as salary and 60k in net profit. I do a K1 for the 60k. I understand I pay payroll tax on 40k, and federal on the entire amount. Do I pay dual state taxes for both IL and NM? If yes, what portion is subject to both states? The salary portion or profit or both? This abstract is very much useful in determining Tax status. Me and my wife have an LLC for IT Consulting, we are the owners / employees for this LLC and dont anticipate any employees in near term. With 2018 tax law changes – I believe LLC also enjoys 20% of deduction as pass-through – is that correct ? If our LLC is making 100K / year – does it make sense going with S Corp Status ? Your website was very helpful. We are an LLC, sole proprietor (trucking company). My husband is the owner. We have no employees. We are considering filing 2553 to elect to be taxed as an S Corp. I understand that in doing that, we would then pay ourselves a salary (subject to self employment tax on our personal tax return) and can also receive dividends (not subject to self-employment taxes). In your pros and cons section, it says that “an S corp must pay unemployment tax and FICA taxes for wages paid to owners who draw a salary.” Does that mean that as the owner, I would need to pay unemployment tax on the salary I would draw? I would appreciate your response. Thank you!